Spacious and Cozy Condo that puts you close to the Slopes and Village. 3 Bedroom 2 Full Bathrooms, seconds from the Slopes. Come stay in the penthouse at the deluxe Black Diamond Condos with views from every room. This newly appointed 3-bedroom, 2 full bathroom unit with extra high ceilings, is ideally located near the trails and the village. The 'Home Again' trail that takes you to the lifts is just 100 yards away. Penthouse B will keep you toasty warm with radiant heated floors and a stone gas fireplace. Guests can also enjoy the use of a private, over sized, heated garage. There is a second parking spot reserved in the driveway. Big Mountain at Whitefish Mountain Ski Resort offers world-class skiing and snowboarding with unprecedented views of Glacier National Park, Whitefish Lake, and Flathead Lake. The resort has both day and night skiing available. Snowmobiling, cross country skiing, and snow shoeing are available in town or just 45 minutes away in breathtaking Glacier National Park. 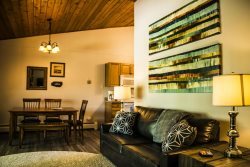 You are also just a 10 min drive from the internationally famous western town of Whitefish, which is lined with restaurants, shops, galleries, spas, and nightlife. If your legs are tired from skiing or just looking for a change of pace, you have other options such as dog sledding and sleigh rides conveniently located in the Whitefish area. The possibilities are exciting and endless. Enjoy! !